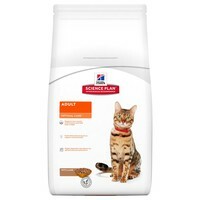 Hills Science Plan Optimal Care Adult Cat Food (Lamb) is suitable for adult cats from 1 to 7 years of age. Hills adult cat food contains superior antioxidant formulation, is a high energy diet to reduce oxidative cell damage and maintain the immune system whilst meeting a cats energy demands without the need for large meals. Protein and sodium have been carefully balanced for good health, whilst the magnesium, phosphorus and pH are controlled to support urinary tract health. This product is not recommended for kittens, pregnant or lactating queens. During pregnancy queens should be switched to Science plan kitten food.